La oferta de super-super coches está en una espiral loca, cada vez nacen propuestas más arriesgadas, potentes y, creo yo, cada vez más incontrolables. Y muchos de ellos en el campo de los vehículos eléctricos. El No-Va-Más actual procede de Bulgaria, no precisamente un país con una producción automovilística importante. El Alieno Arcanum tiene... 5.221 CV y un par motor de 8.880 Nm, alcanzando los 488 km/h (antes de despegar) - todo ello completamente eléctrico. Tal locura de automóvil - ¿quién va a dominar tan brutal par motor, potencia y velocidad? - nos sirve para dejar definitivamente claro que el automóvil eléctrico puede convencer en todo, y está totalmente por encima y superando con creces al automóvil con motor de gasolina. Nos demuestra que técnicamente hoy día todo es posible con la tracción eléctrica. Como dicen los búlgaros: nuestra empresa crea hípercoches del futuro, o sea, alienígenas que vienen de un futuro para demostrarnos que la electromovilidad no solo es atractiva y necesaria, sino que quiere demostrar, sin duda, hacía donde tiene que ir la humanidad. ¡Decir adiós al petróleo! 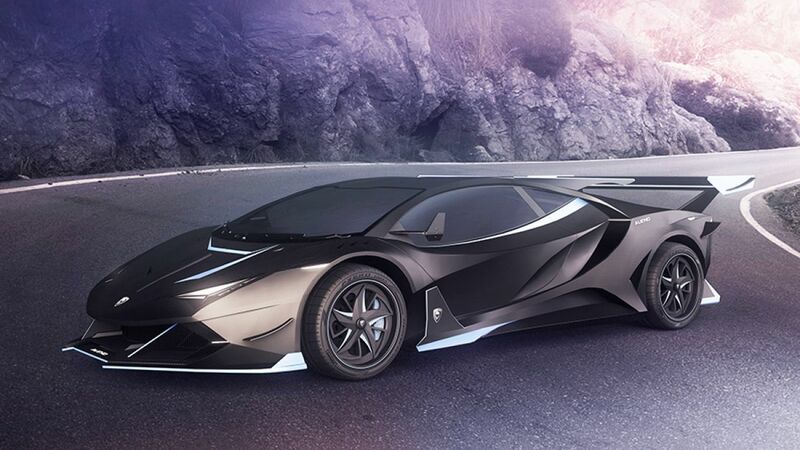 ALIENO ARCANUM is an all-electric hypercar, which in its top version has power of 5221 hp (3840 kW), 8880 Nm of torque, a top speed of over 488 km/h (303 mph) and a power-to-weight ratio of up to 2.64 hp/kg.The name of the brand is derived from the Italian word "alieno", which means "alien", the name of the model is derived from the Latin word "arcanum", which means "the secret of the secrets". 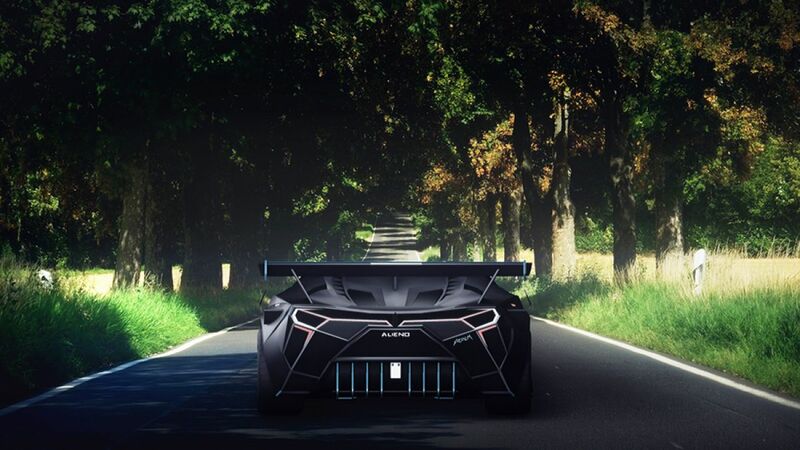 Ahmed Merchev, founder, CEO & CTO of ALIENO and chief constructor of ARCANUM, shares: "ALIENO ARCANUM is an all-electric hypercar from the future with a brutal technical superiority, which is in the basis of the DNA of the brand ALIENO. This our first debut model, expresses clearly the mission of ALIENO to create hypercars with alien technologies from the future into the present. ALIENO ARCANUM does not follow the rules, but it creates new ones, providing an extremely exciting driving experience and enjoyment. By this, it touches not only the senses, but also your soul. Moreover, considering the intelligence of the car achieved through the ALIENO artificial intelligence systems built into it, it is like having at disposal your own alien, being your guide, your guardian and who teaches you how to reach its full potential, while driving it." Based on their power, ALIENO ARCANUM is available in the following 4 versions, which are also applicable for all other ALIENO models: RP5 with power of 5221 hp, RP4 with power of 4351 hp, RP3 with power of 3481 hp and RP2 with power of 2610 hp. Where RP stands for "Raw Power", while the corresponding number after it (5, 4, 3, 2) shows the approximate power of the version in thousands of horsepower. ALIENO ARCANUM has an innovative ALIENO chassis, built entirely from pre-preg carbon-fiber and honeycomb core and consists of carbon-fiber monocoque with carbon-fiber front and rear subframes. The bottom is reinforced with Kevlar. There are structural reinforcements and crumple/deformation zones for front, rear, side, upper and lower impacts, as well as front and rear carbon-fiber crash structures. In addition to its low weight, safety and strength, the chassis also features maximum torsional rigidity and allows the construction of a lightweight and aerodynamic shape of the exterior. All core nodes (elements) of the car are robotic and are regulated electronically. 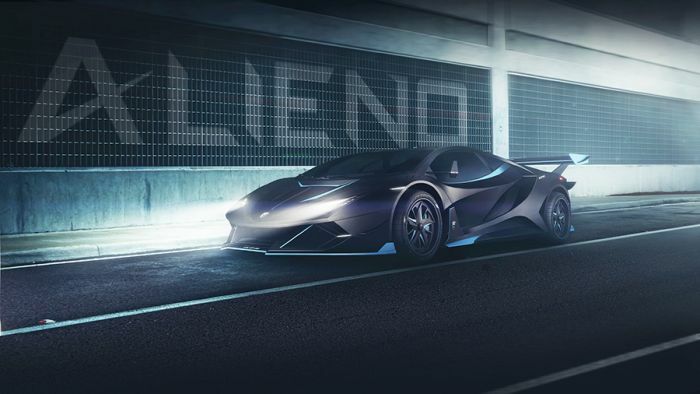 ALIENO ARCANUM has innovative ALIENO active, robotic and adaptive aerodynamics, with a lot of active robotic elements, flaps and mechanisms, part of which are visible in the exterior design, while others are inside of the car. This innovative technology, allows for an improved movement and channeling of the airflow around the car, with main purpose of increasing the stability and the drag of the car to the road. Of course, depending on the need, this drag can be easily and precisely adjusted, for achieving higher speed. ALIENO ARCANUM is driven by an innovative ALIENO direct drive electric powertrain, realized with from 3 (in the RP2 version) up to 6 (in the RP5 version) electric motors per wheel. Total of 12 (in the RP2 version) up to 24 electric motors (in the RP5 version). The electric motors are connected with a common connecting axis, to transfer the power to the according wheel through a half-shaft. Instead of one big electric motor, several smaller ones are used, that are individually controlled (each from its own motor controller) according to the needs, which significantly increases the possibilities and efficiency of the car in all its modes and speeds and the efficiency reaches up to 97%. The powertrain has 3 different basic drive modes (Street, Track and Race), which are activated depending on the desired use of the car and the desired dynamic characteristics preferred by the driver. In any of these modes, through adjustments of the load on the respective front and rear electric motors (the electric motors connected to the front wheels and the electric motors connected to the rear wheels), there is the possibility to precisely change the distribution of power between the front wheels and the rear wheels from 0% to 100% and from 100% to 0% respectively. In any of these combinations, the control system has the possibility to provide energy efficient drive of the car. Apart from that, innovative ALIENO real-time system for vector control of the torque of each wheel separately has been implemented in the control system, thanks to the individual and direct drive through electric motors of each wheel (from 3 to 6 electric motors per wheel) and the lack of mechanical reducers containing heavy and bulky mechanical parts with friction parts. Given the ALIENO direct drive, the torque of the powertrain and the wheels is identical and is 8880 Nm in the RP5 version, 7400 Nm in the RP4 version, 5920 Nm in the RP3 version, and 4440 Nm in the RP2 version, and is practically available from 0 to the maximum rpm of the electric motors, i.e. at any speed of the car. ALIENO ARCANUM is powered by an innovative ALIENO battery, composed of Graphene LiPo cells and Supercapacitors. Graphene LiPo cells are built through nanotechnologies forming graphene (a single layer of carbon atoms arranged in a hexagonal lattice). In comparison with the standard LiPo cells, the Graphene LiPo cells are capable of maintaining greater power output, have a higher energy density, lower internal resistance, higher discharge and charge rates, longer life span, and they stay way cooler and stable under full load and peak operating modes. The supercapacitors, accumulate energy from the electric motors when the car is braking and they give it back to the powertrain when needed, mainly in the peak dynamic modes - when starting, accelerating and braking the car. The battery is available in the following 3 variants: SBP (Street Battery Pack), with a capacity of 180 kWh, TBP (Track Battery Pack) with a capacity of 120 kWh and RBP (Race Battery Pack) with capacity of 60 kWh. They cover all practical needs: the SBP battery provides a long mileage, reaching up to 1020 km on a single charge, the TBP battery provides enough mileage of several laps on a track, while the RBP battery provides the lowest weight and respectively maximum dynamic characteristics of the car during races. At maximum load in mode Race, on a single charge, depending on the battery with which it is equipped (variant RBP, TBP or SBP), its version and modification, ARCANUM can complete from 1 to 3 full laps on the track Nürburgring (on which the race 24 Hours Nürburgring takes place) and from 2 to 6 full laps on the track Circuit de la Sarthe (on which the race 24 Hours of Le Mans takes place). The maximum voltage of the battery is 800V, as it is designed to provide huge power, where in the SBP variant it can reach up to 11.7 MW continuous power and 23.4 MW peak power. Furthermore, the battery is capable of absorbing huge power during charging and regenerative braking, reaching up to 2.7 MW in the SBP variant. The battery consists of few ALIENO Plug & Play interchangeable modules, as the car automatically adjusts its parameters according to the number and the status of the installed modules. It is possible to install different number of modules, with the idea of providing different capacities between the three base variants of the battery. In this case, according to the desired number of battery modules, "the alien” guides the user, where exactly he should place the modules, in order to achieve maximum stability and lowest center of gravity of the car, and of course achieving optimal weight distribution between the front and rear axles. ALIENO ARCANUM has several different options for charging of the battery, including a wireless inductive, 3-phase 22 kW on-board and 350 kW DC Combo (CCS). Optionally available is also 400 kW DC CHAdeMO. With a 350 kW DC Combo (CCS) charging station, from 0 to 100% SoC (State of charge), the SBP battery is charged for 30 min, the TBP battery for 20 min, and the RBP battery for 10 min. ALIENO ARCANUM has overall length of 5240 mm, overall width of 2180 mm (without and with the ALIENO aerodynamic side digital mirrors) and wheelbase of 3100 mm. The height of the car, depending on the setting of the ground clearance, varies from 1170 mm to 1200 mm in Race mode, from 1190 mm to 1230 mm in Track mode and from 1220 mm to 1270 mm in Street mode. The ground clearance of the car, is fully electrically-adjustable, as on the front and on the center of the car can be adjusted from 60 mm to 90 mm in Race mode, from 80 mm to 120 mm in Track mode and from 110 mm to 160 mm in Street mode, while at the rear it is with 40 mm larger. The weight of the car, varies depending on its version and modification, starting from 1620 kg. For all versions and modifications, a power-to-weight ratio of more than 1 hp/kg is achieved, ranging from 1.04 hp/kg to 2.64 hp/kg, depending on the version and modification of the car. In addition to a total of 8 airbags (4 for the driver and 4 for the passenger) and 2 racing 5-point seatbelts / harnesses (one for the driver and one for the passenger), ALIENO ARCANUM also has numerous innovative ALIENO structural, dynamic and active intelligent safety systems. ALIENO ARCANUM is available for pre-orders at the following base prices: 750 000 EUR for the RP2 version, 1 000 000 EUR for the RP3 version, 1 250 000 EUR for the RP4 version and 1 500 000 EUR for the RP5 version. The delivery time varies from 18 to 30 months, depending on the chosen modification (STR, TRC or RCE) and other options chosen by the customer.